Sitting reverently at the feet of Lennon & McCartney...& then stealing their shoes. 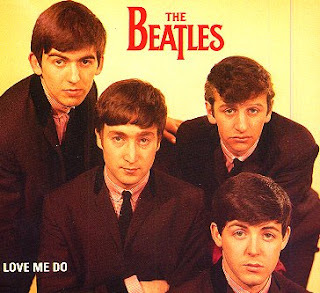 The first Beatles song deemed fit for public consumption shines, like much of the debut album, because of the playing more than the writing. 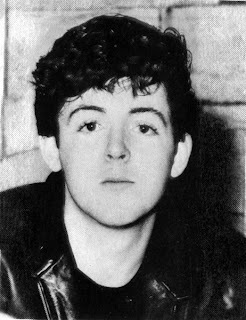 One of McCartney’s earliest efforts (written when he was 16) the fact that it manages to be such a good song is intriguing because of how much is missing. There are only 19 words in the whole song! The melody almost completely avoids the 3rd, major or minor, giving it a stark sound, odd and original, almost autistic. The verse melody has an AAABC structure and the bridge ABAB. The verse has only 2 chords - I (G) and IV (C) and the bridge 3 - I (G) IV (C) V (D). The arrangement is pathologically simple, 1 verse (played 4 times) and 1 bridge (played twice). Something so primitive should be as compelling to listen to as a caveman banging two rocks together. And yet somehow it works, and people are still buying it (and blogging about it) 47 years later! Why? I haven’t a clue! Sure it’s carried along by great performances - nice country style vocal harmonies, bluesy chromatic harmonica and solid drumming from session man Andy White* but this track is far more than the sum of it’s parts. That it’s not a great song is entirely understandable. That it’s a good song is utter bewildering, but there it is.